The story starts here, ten days, 342 miles, eight days of riding, twelve riders (one woman), two countries. 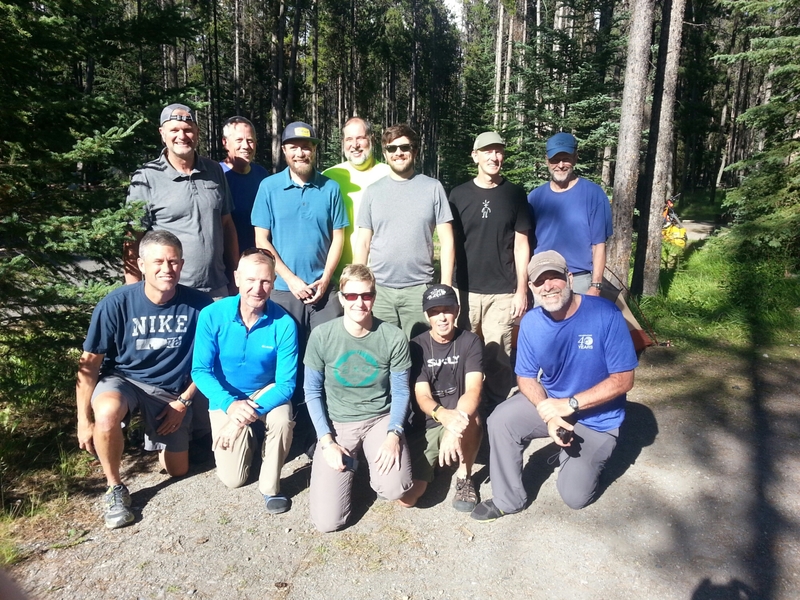 We all arrived at the Whitefish Bike Retreat in Whitefish, Montana July 9, met our leader, Nickel, for our orientation over pizza and beer from the Retreat. 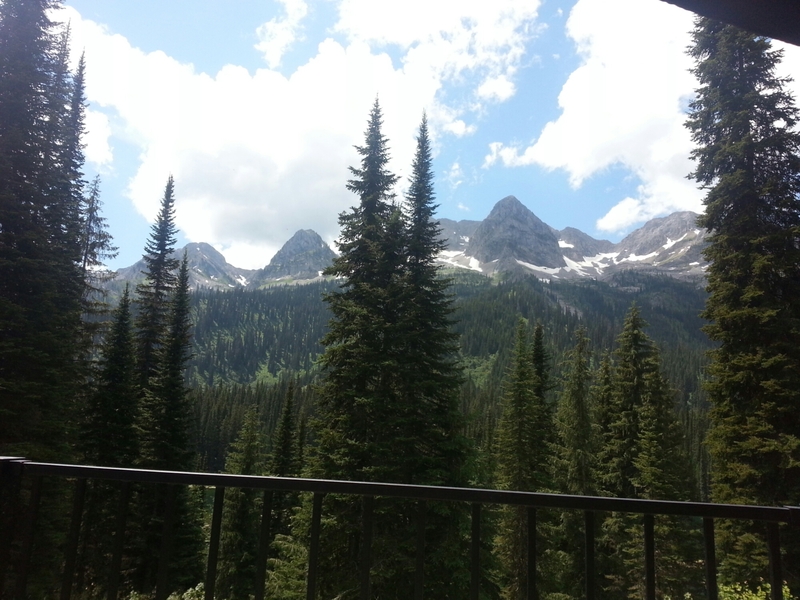 Riding in a van with twelve people is never fun but the scenery was spectacular, once we crossed the border.with Scott, who had forgot to renew his passport until too late and had to pay a $400 expedite fee, expecting it to arrive in Fernie. Apparently you can get into Canada with only a birth certificate but can’t get back into the US. A giant leap of faith by Scott in the US government and FedEx. 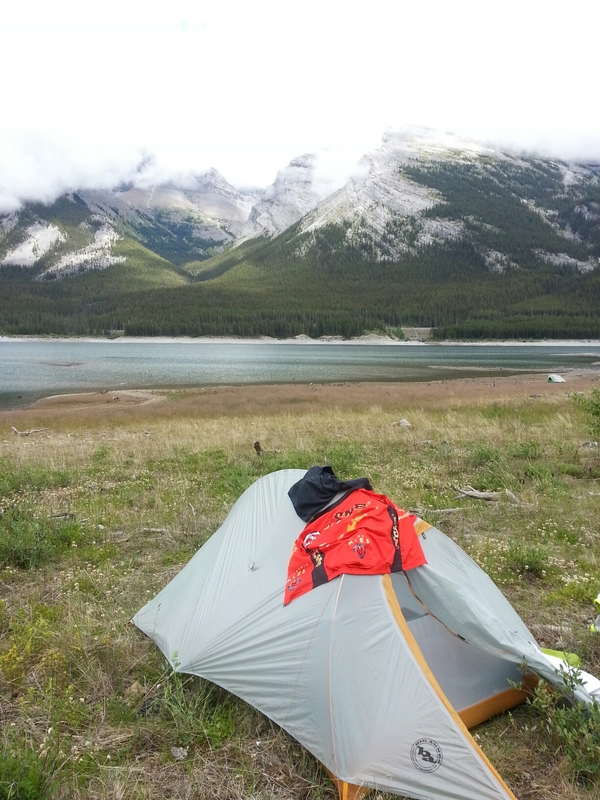 Once in Banff, we set up camp at the Tunnel Lake Campground. The provincial ranger, Mark, came by to scold us for five minutes about leaving food unattended. We got it after thirty seconds, but had to endure stories about alpha wolves that had to be destroyed because of careless campers, like us. We loved Mark. In the morning, we found out that the bathrooms are locked until 7:00 am, to keep the critters out. That was uncomfortable. The start of the ride was downhill into Banff. Standing five feet off the sidewalk was a large elk, we assumed he was paid by the Chamber of Commerce to stand by the road greeting tourists. Impressive and scary all at once. 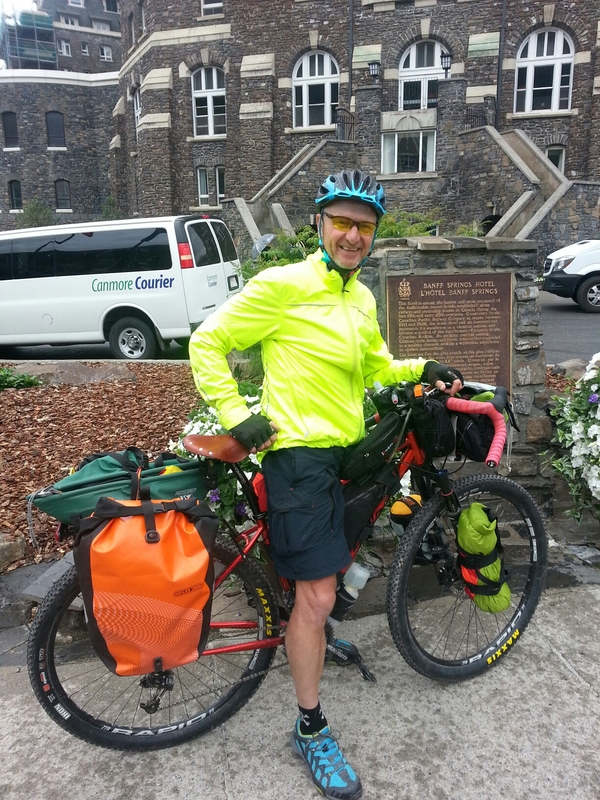 The highlight of Banff is the Banff Springs Hotel, a giant stone structure and the official start of the Great Divide Mountain Bike Route. The first day of riding was a short one, and I had assumed it would be an easy roll out of town on a bike path, I was wrong. The gravel path quickly changed into a rough and rolling road. Our leader had given us instructions on where our, primitive, camp for the night was, saying look for the two large rocks. Amazingly, we found it.We set up tents in an open field by the reservoir. It rained overnight but the second day broke with some sun. We headed out, knowing we had a relatively long ride. Sure enough the drizzle started and the mountain views became fewer and far between. Did I mention, it was a 50 degree day and 50+ miles? Day three was the one I’d been worried about, we start out the morning with a climb over Elk Pass. Nickel gave us the map guidance the night before, telling us the first climb was called “The Wall” and there may be some pushing required. He didn’t lie. We pushed our bikes for a good half mile, harder than riding. Then the rain started, did I mention it was 42 degrees? The climbs after that settled out and followed a powerline cut. When we got to the high point, the trail leveled out, but that meant the trail also became rutted and full of muddy puddles. Sweet. A rider passed us in the opposite direction just as I was bombing down a short roller. As I came over the rise, I saw a giant bear wander across our trail a quarter mile ahead. I yelled “bear” to Jim, only to realize he’d stopped to talk to the rider and was nowhere in sight. Double sweet. We made a lot of noise as we rode from that point on. It turned out the pass was not difficult at all, even though it is the highest elevation on the ride at 6450-ish. The rest of the day was mostly wide, wet gravel roads with longer sustained climbs. 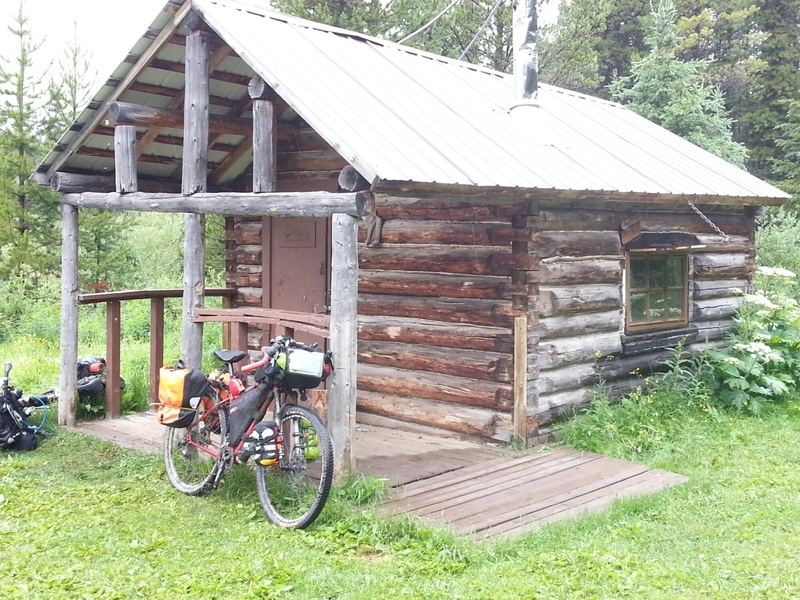 One of the highlights on the pass is an old cabin that had a lot of history from riders on the race along the route. We stopped to take it in. The destination for the day was Elkford, a small mining town, coal mining. 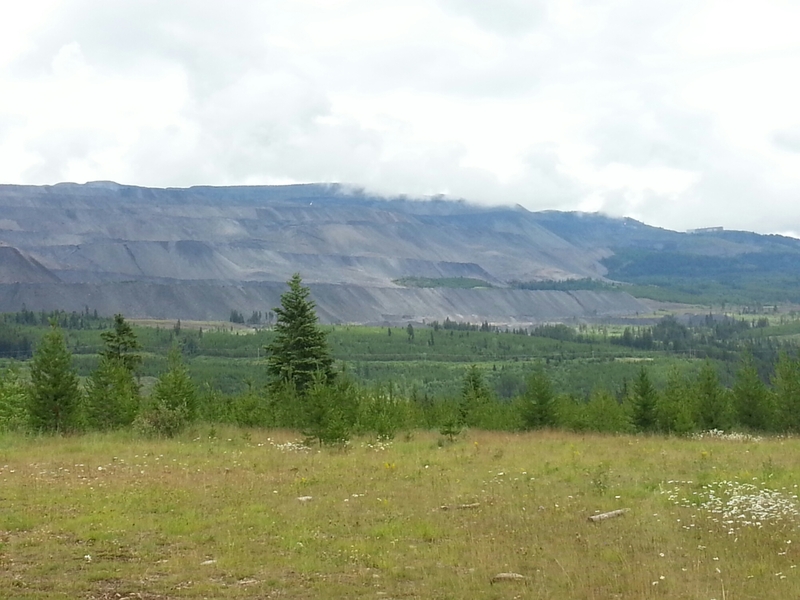 We had a view of the above ground terraced mining, with giant trucks crawling across the face. Again, the sun came out, we dried our tents, had dinner, it rained all night, packed up wet tents and hit the road for Fernie, our layover day destination. 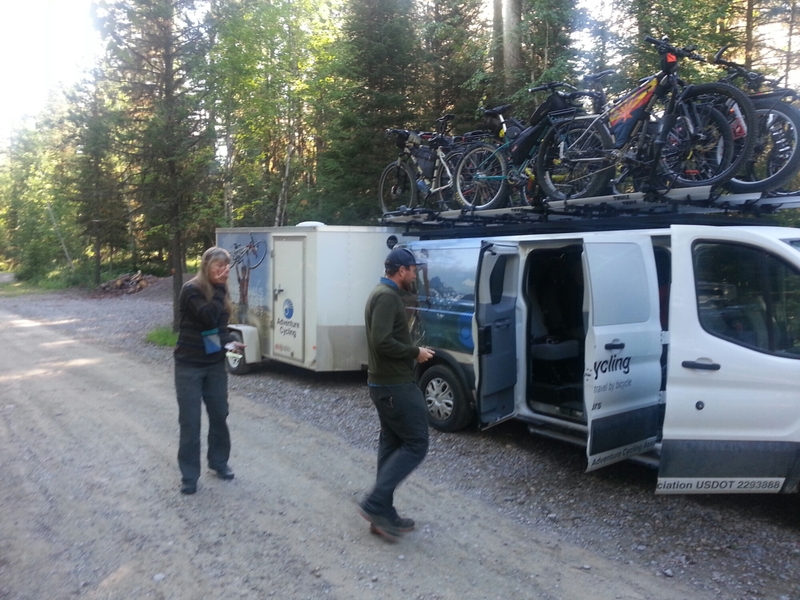 Fernie is a ski town with tons of mountain biking trails. Our ride there is on the “Fernie Alternate” mapping by the ACA. The good news, it avoids a washed out section, a big climb and a road destroyed by logging that the rider Jim talked to the day before couldn’t stop swearing about. The bad news, it was along busy highways. It felt like the Pacific Coast all over. 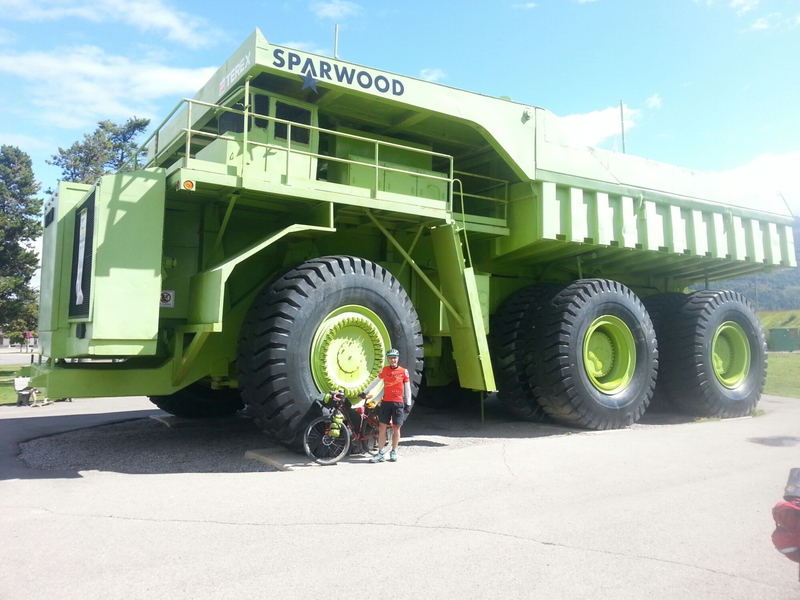 At the midpoint was Sparwood, another mining town with the largest truck in the world. The wheels are ginourmous I’m doing my Da Vinci Andromeda Man. 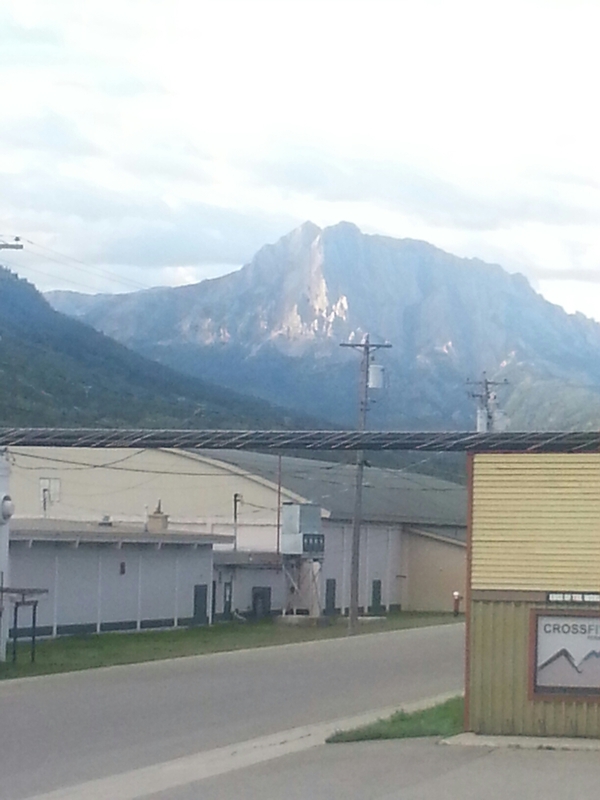 Our home in Fernie is the Raging Elk hostel. It has a full kitchen, game room, bar a laundry and a patio. Really comfortable. The deck has a view of the Ghostrider on the mountain. there is a legend about it that is longer than I can share and less than believable. I’ll let you check it u on the internet, and see if you can make it out in the picture. The other benefit of Fernie is quality bike shops. Several of us went over, I hadn’t planned on any service but noticed I had a rear wheel wobble (loose spokes) and gritty sound in the hub (bearings).they kept the bike overnight and fixed it up. Today was our rest day. some sat on the deck, some napped, some took in the spa. Jim and I went biking. The plan was the Lazy Lizard trail, easy by BC standards. It started out with a serious climb just to get to the trailhead, then went up. Pete started up with us, missed a dab and rolled down a bank, with his bike. He turned back. We continued and had a really nice ride. Then, we were feeling our oats and decided to ride to Island Lake Lodge for lunch. Only 7K, how hard could it be? The answer… Really hard. It was a continuous series of ten to twelve percent grade climbs. what Nickel calls “punchy little climbs”. But, the lodge had a great deck with a view. Back into town, I stopped along the Elk River to pick some Saskatoon berries(?). They are like a cross between blueberries and huckleberries, a local favorite. We’ll be putting them in our free pancakes at breakfast. Tomorrow we ride again. A relatively easy day. Then we get across the border and have some tougher climbs. We should be hardened by then. So far, the ride has been both challenging and rewarding, living up to the billing. The chemistry of the group is really good and Nickel is the perfect leader. We’re halfway done and I’m not sure if I’m relieved or sad. ,, probably have to do a wrap-up post when we get back to Whitefish as there is not a lot of civilization between here and there.